Often when developing with psychotoolbox or psychopy/opensesame your program crashes. And I often then have a full-screen window open and cannot click somewhere else. I then try to Alt+Tab and execute “sca” (screen close all) into the matlab console, with often mixed success. Sometimes restarting the computer is the last option. Instead of restarting, a useful command in older ubuntu versions was: STRG + ALT + Backspace => restart X server (=> restart GUI). From time to time I explain my students certain concepts. To archive those and as an extended memory, I share them here. We also recently had some discussion on vectorization in our research group. e.g. in python and matlab. With the second link claiming for-loops in matlab are performing much better than before. While demonstrating this to my student, I noticed that subsetting an array has interesting effects on the performance differences. The same is true for different array sizes. Therefore, I decided to systematically compare those. bsxfun is fastest if one needs to subset a medium sized array (n x m >100 x 1000), but see update below! 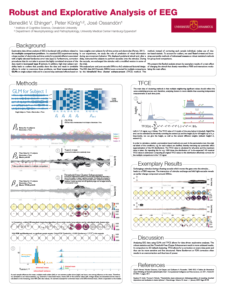 I got asked for the design of my academic posters. Indeed I have templates in landscape and portrait and I’m happy to share them. In addition I can recommend the blog better-posters which has regularily features and link-roundups on poster-design related things. In my newest poster (landscape below) I tried to move as much text to the side, so that people can still understand the poster, but it does not obscure the content. I also really like the 15s summary, an easy way to see whether you will like the poster, or you can simply move on. Maybe it even needs to be a 5s summary! These are two examples posters based on my template. The corners are based on illustrator effects, thus resizing the containers does not change the curvature. Before I often had very strange curvatures in my boxes. No more! To make sense of the world around us, we must combine information from multiple sources while taking into account how reliable they are. When crossing the street, for example, we usually rely more on input from our eyes than our ears. However we can reassess our reliability estimate: on a foggy day with poor visibility, we might prioritize listening for traffic instead. But how do we assess the reliability of information generated within the brain itself? 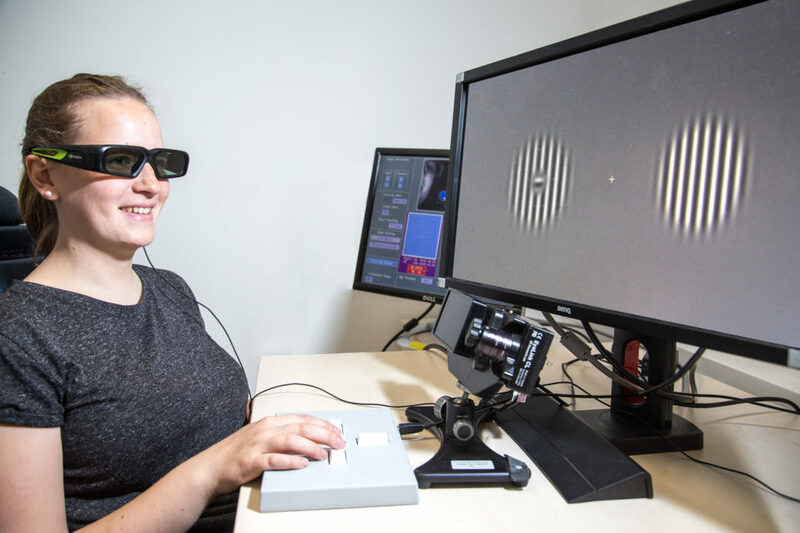 We are able to see because the brain constructs an image based on the patterns of activity of light-sensitive proteins in a part of the eye called the retina. However, there is a point on the retina where the presence of the optic nerve leaves no space for light-sensitive receptors. This means there is a corresponding point in our visual field where the brain receives no visual input from the outside world. To prevent us from perceiving this gap, known as the visual blind spot, the brain fills in the blank space based on the contents of the surrounding areas. While this is usually accurate enough, it means that our perception in the blind spot is objectively unreliable. Keep your eyes fixed on the cross in (a). Close the left eye. Depending on the size & resolution of your screen, move your head slowly closer to (or sometimes further away from) the screen while looking at the cross. The dot in (a) should vanish. You can then try the same with the stimulus we used in this study (b). The small inset should vanish and you should perceive a continuous stimulus. 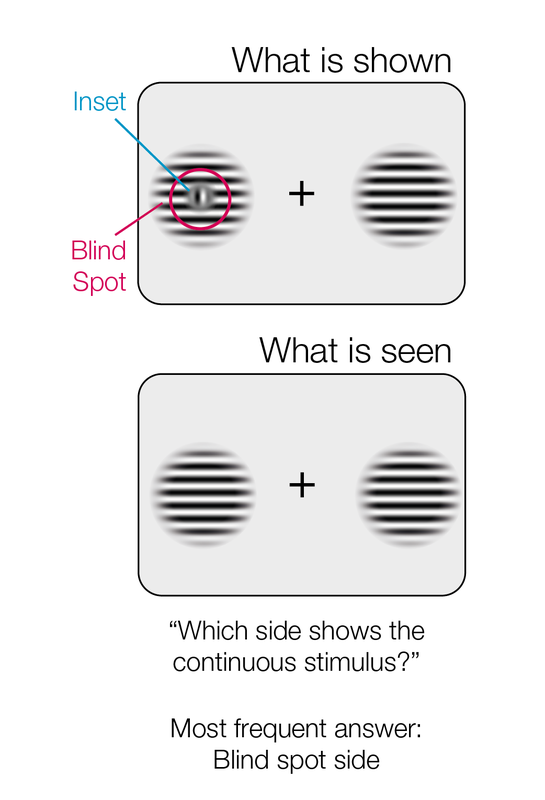 To find out whether we are aware of the unreliable nature of stimuli in the blind spot we presented volunteers with two striped stimuli, one on each side of the screen. The center of some of the stimuli were covered by a patch that broke up the stripes. The volunteers’ task was to select the stimulus with uninterrupted stripes. 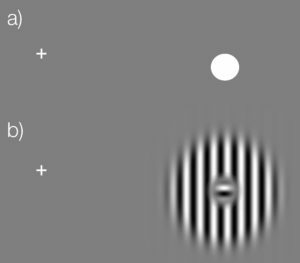 The key to the experiment is that if the central patch appears in the blind spot, the brain will fill in the stripes so that they appear to be continuous. This means that the volunteers will have to choose between two stimuli that both appear to have continuous stripes. The experimental setup. Only the case where the left stimulus is in the blind spot is shown here. 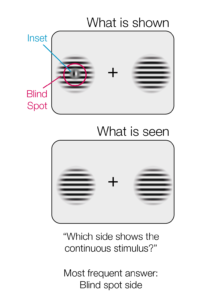 If subjects have no awareness of their blind spot, we might expect them to simply guess. Alternatively, if they are subconsciously aware that the stimulus in the blind spot is unreliable, they should choose the other one. 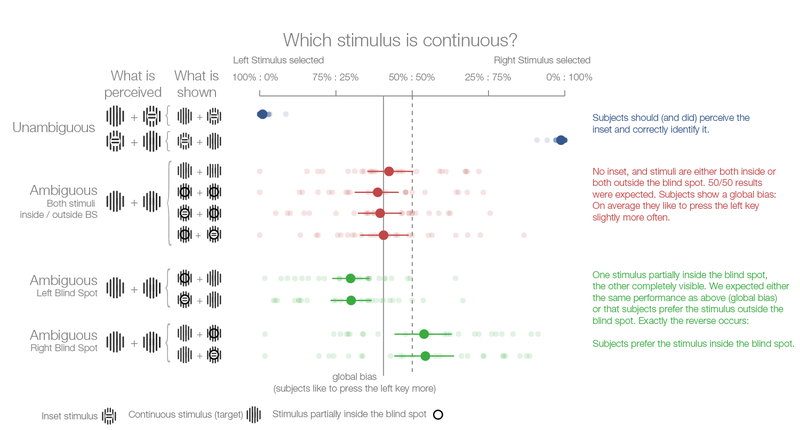 The volunteers chose the blind spot stimulus more often than not. This suggests that information generated by the brain itself is sometimes treated as more reliable than sensory information from the outside world. Future experiments should examine whether the tendency to favor information generated within the brain over external sensory inputs is unique to the visual blind spot, or whether it also occurs elsewhere. The results of the first experiment. Four subsequent experiments confirmed this finding. All images are released under CC-BY 4.0. You see structure where there is none (e.g. rings in the third example). We want to overwrite the one line, but keep it forward compatible i.e. we do not want to copy the whole icadefs file, but just replace the single line whenever icadefs is called. This has the benefit that it will always work irrespective of your path-ordering. The con is, you will loose the change if you switch eeglab versions or update eeglab. This has the benefit that it will carry over to the next version of eeglab, but it is an extra file you need to have somewhere completly different than your project-folder (your user-folder ~/eeg_options.txt). It is thereby hard to make selfcontained code. Important: The folder to your icadef file must be above eeglab in your path. Try this: edit('icadefs.m') to see which function comes up. If the eeglab-one comes up you have a path conflict here. Your own icadefs has to be above the eeglab one. I sometimes explain concepts to my students. Then I forget the code and the next time round, I have to redo it. Take this post as an extended memory-post. In this case I showed what filter-ringing artefacts could look like. 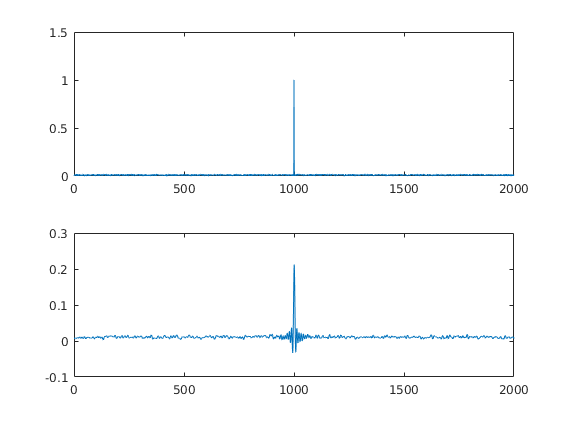 This is especially important for EEG preprocessing where filtering is a standard procedure. I simulated as simple impulse response with some additional noise. 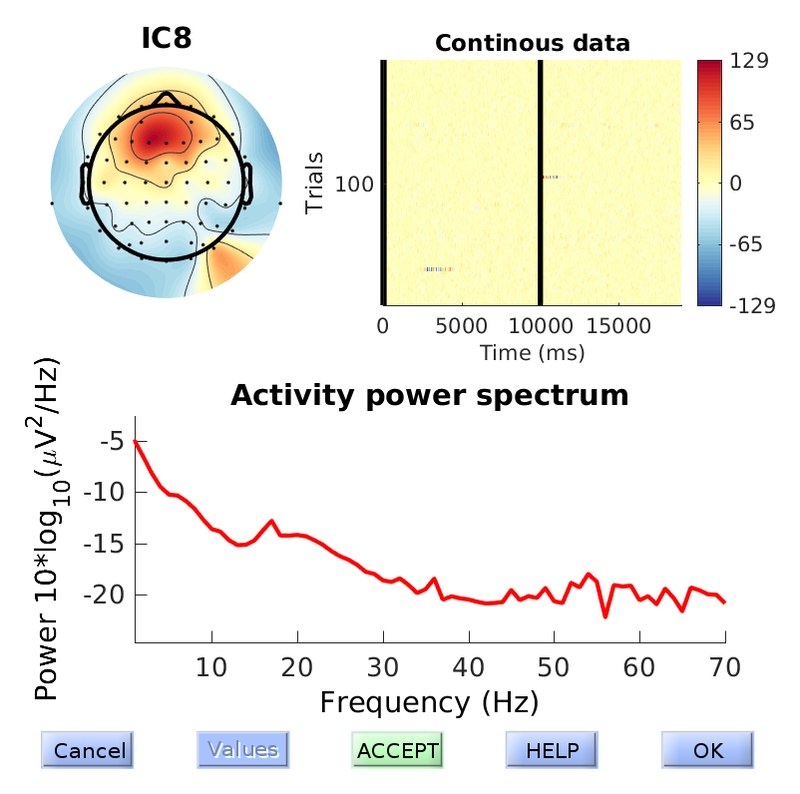 The idea is to show the student that big spikes in the EEG-data could result in filter-ringing that is quite substantial and far away from the spike. This is the filter I generated. It is a BAD filter. 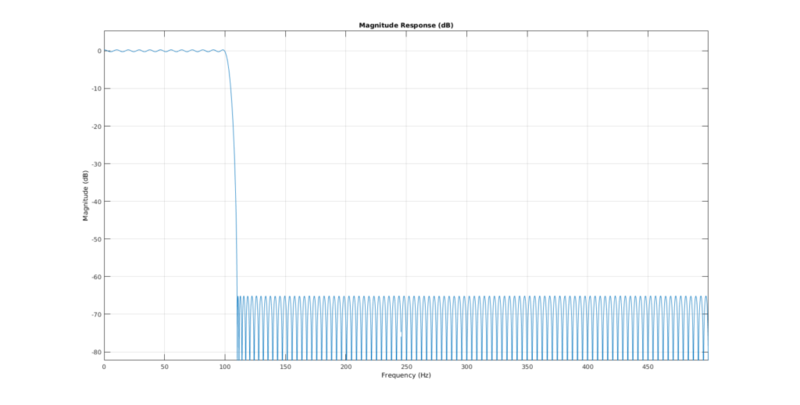 It shows huge passband ripples. But for educational purposes it suits me nice. I usually explain what passbands, transitionband, stopband, ripples and attenuation means. Logistic Regression: Will it rain in Osnabrück tomorrow? Is it sunny? 2x as likely that it is sunny tomorrow as well. It is a somewhat naive analysis. Further improvements are discussed at the end. The data range from 1989 up until the end of 2015. 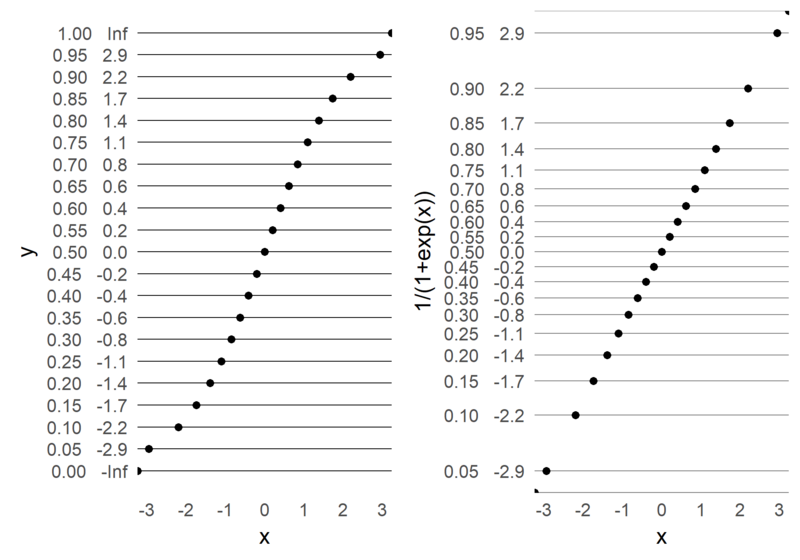 Notice that the plot on the left is in native scale, the one on the right in x-axis-log-scale. We take the mean of rainy days (ml/day > 0): There is a 52% probability it will rain on a given day (what everyone living in Osnabrück already knew, it rains more often than not). For exercise reasons I made several logistic regressions. I try to predict whether there will be rain on the day afterwards, based on the amount of rain on the current day. 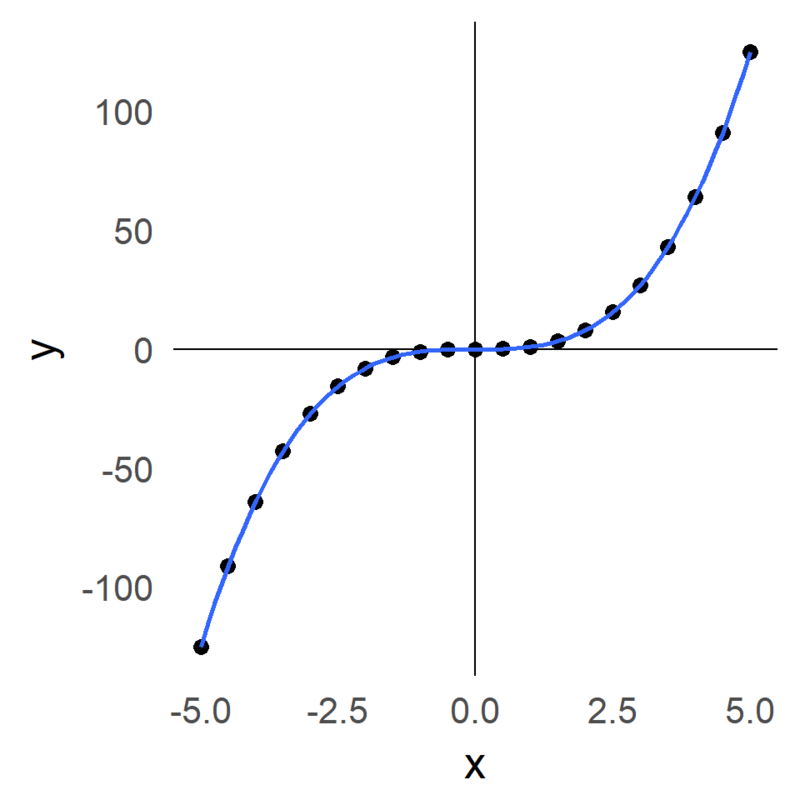 Whoop Whoop, Wald’s t-value of ~35! 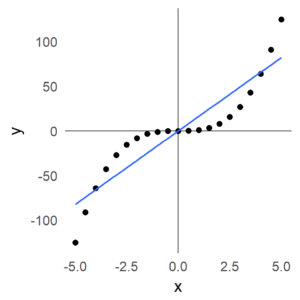 Keep in mind that the predictor values are in logit-space. 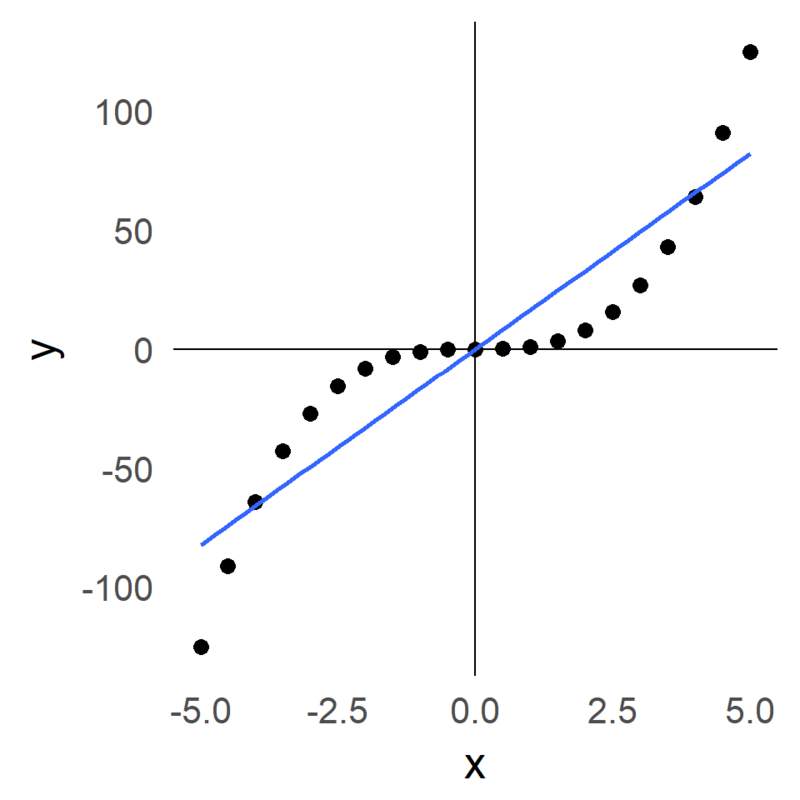 That means, a predictor value of -0.72 is a log-odd value. 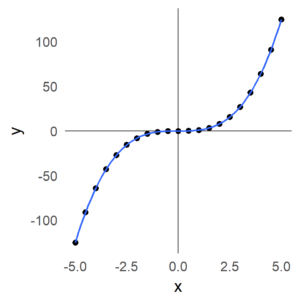 In order to calculate this back to an easier interpreted format, we can simply take the exponential and receive the odds-ratio. The odds of rain tomorrow if it was a rainy day are 2.3:1, i.e. it is more than double as likely that the next day is rainy, if it was rainy today. 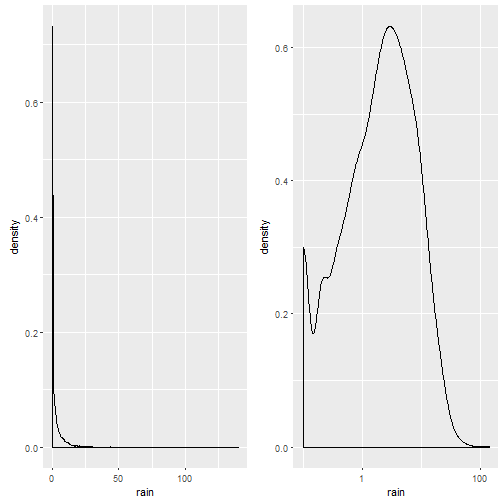 We could try to predict rain based on the daily continuous precipitation (in ml). We will compare this with the previous model using BIC (smaller number => better model). 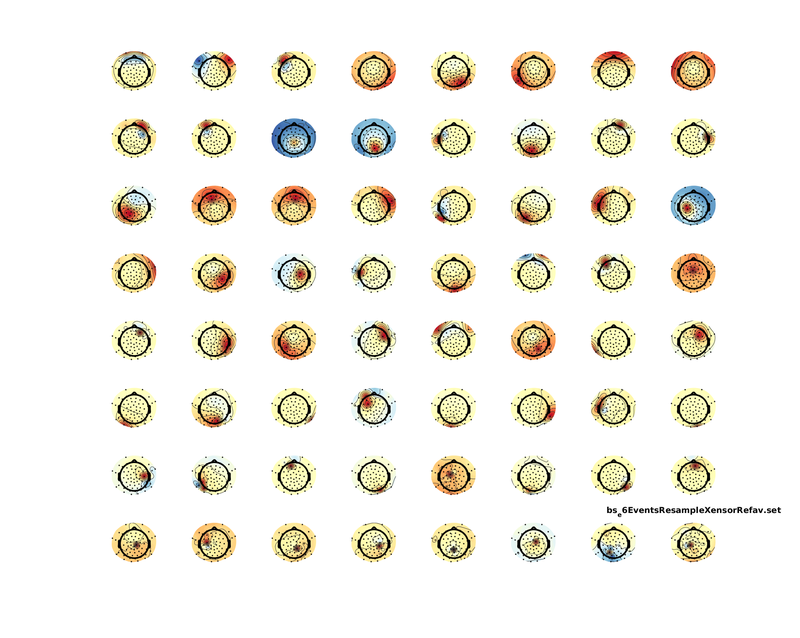 Turns out: No, a categorical model (is there rain today, or not?) beats the continuous one. But why? It is surprisingly hard to beat the simple first model, but in the end – we did it! 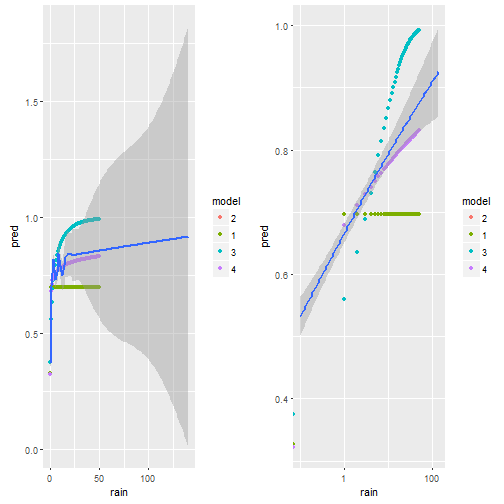 The log(rain) model seems to capture the data best. 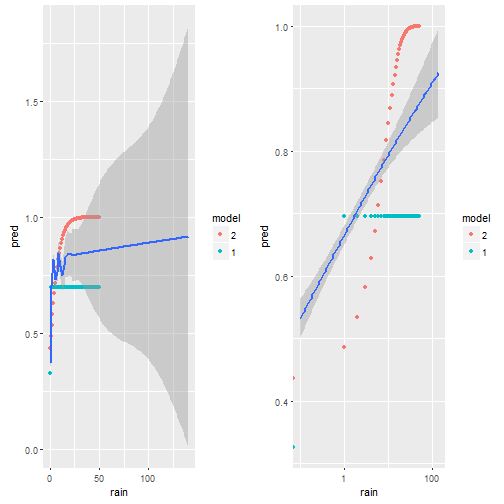 Visually we can see that model 4 comes the non-linear smoother the closest. This post was directly exported using knit2wp and R-Markdown. It works kind of okay, but clearly the figures are not wide enough, even though I specify the correct width in the markdown. I might upload them later manually. I did not find anything on google or the manual of how to do this. If there is a smarter way to do it, please leave a comment.